Laurie Montgomery (for those who don’t know Laurie is a NYC Medical Examiner) and her unstoppable curiosity find themselves entrenched in a medical mystery involving multiple cases of a fast evolving, and killing, MRSA bacteria. Most of the cases of this virulent form of MRSA are coming from various specialty hospitals under the umbrella of Angels Healthcare. Digging into the similarities of the case and the cause, Laurie attracts the attention of two sets of people who set out to kill her. To add spice to the story, Jack Montgomery is due for surgery in an Angels hospital. Arrrghh. 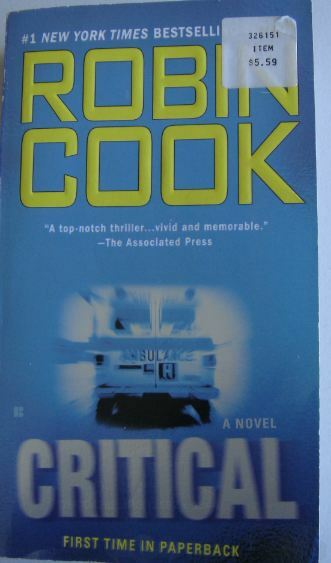 “Critical” is another excellent Robin Cook medical mystery thriller with thrills and chills galore.